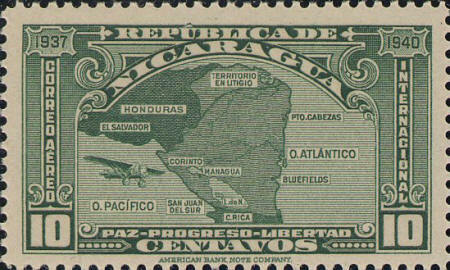 Walter Klinefelter discussed this stamp in his "Some Errors in the Designs of Map Stamps," (The Cartophilatelist Vol. 2 No. 1 p. 12. The area in question is that designated "Territorio in Litigio," referring to the conflicting claims to the territory by Nicaragua and Honduras. I would prefer to consider this a matter of propaganda, rather than a design error.